So one Monday night, two crucial games and the only two professional teams that I follow, on at exactly the same time. Usually football is the priority. The Jets have only 16 games in their regular season and they're all crucial until the annual tragic elimination. The Yankees on the other hand were playing a road playoff game, looking to go up 2-0 on Baltimore. What do you do? Well the first thing is to make sure you make dinner ahead of time. The Yankees/O's was scheduled for 8 PM ET, and the Jets/Texans at 8:30, so plenty of time for chicken and sausage nachos with green olive salsa. Since the Yankees were delayed 45 minutes by rain, I put the Jets on the big screen and the Yankees in the office 30 feet away. It's the path I would wear out all night with DVR rewinds ready to get caught up on whichever wasn't getting my immediate attention. After the Texans went right down the field and scored on their opening drive and the Jets responded with a 3-and-out, I changed screens to try and shake things up. And the Yanks scored in the top of the 1st on a bizarre play in which Ichiro Suzuki should've been tagged out twice. Now I'm not saying it was a bad call, but we were fortunate to have Angel Hernandez, the league's worst umpire, presiding over it. Meanwhile, the Jets crowd actually was pumping up their team instead of groaning about them. Antonio Cromartie made a nice pick in front of Andre Johnson, and the Mark Sanchez found Jeff Cumberland for the tying TD. But the good times didn't last. Arian Foster ran 13 yards for a TD on a play that Jon Gruden likened the blocking to a "symphony." Foster was shredding the Jets D for 93 rush yards in 19 minutes of action. Andy Pettitte was mowing down the Orioles' first eight hitters, which prompted Ernie Johnson's first "perfect game" reference, citing the 56th anniversary of Don Larsen's World Series gem. The O's promptly staged a 2-out rally and took a 2-1 lead in the 3rd. Funny how that works. After the Yankees tried to answer, but left the bases loaded in the 4th, the Jets were marching down the field in the 2-minuted drill before the half. Say what you want about Mark Sanchez, but he looks poised in these situations. But as the Jets were closing in on some sort of score before the half, the unavoidable J.J. Watt got one of his big mitts up and deflected a pass to Brice McCain who returned the INT 86 yards. The deflated Jets managed to hold the Texans to a FG in the final seconds and went to halftime down 17-7. Intermission was a good time to fold laundry, and ice a bruised foot that wasn't feeling any better with my constant pacing back and forth. So I relaxed in the big chair while the Yankees offense did nothing, and Pettitte looked solid. The Jets opened the 2nd Half with Joe McKnight in at RB for the ineffective Shonn Greene. It wasn't the understudy that many of the Jets fans wanted (though the one I wanted), and resulted in another 3-and-out. The Texans then went on a 14-play, 70-yard drive that ate up half the 3rd quarter to go up 20-7. The Jets were being manhandled on both sides of the ball and needed a spark. 100 yards later, McKnight was soaring across the goal line after an inspired kick return. The Jets tried to seize on the momentum with a brilliantly executed onside kick, except our guy dropped the ball. Andy Pettitte was pitching well, but allowed a run (the decisive run) in the 6th. After turning a 1-6-3 DP to end the inning, he intensely stalked off the mound chiding himself, "That's on me!" Pettitte finished the night with 7+ innings, 3 runs on 7 hits, 1 walk and 5 Ks. He threw an efficient 98 pitches, and kept his team in it. But it wasn't good enough to win on this night. The Jets held the Texans out of the end zone early in the 4th to stay in the game, but they wasted a strong Tim Tebow run and stalled for a FG themselves. The Jets were in striking range at 23-17, but time was running out. Not to mention the Jets had been plagued by disorganization and miscommunication on both sides of the ball, resulting in the premature use of time outs, which turned out to be a killer. 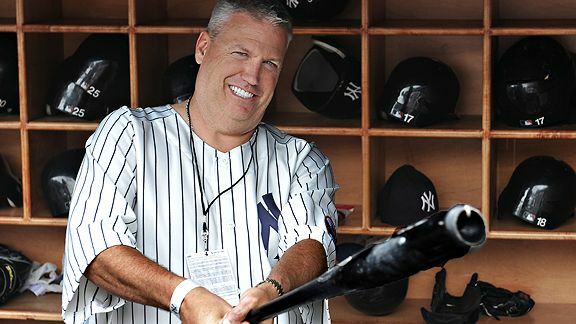 The Yankees got a Derek Jeter RBI single in the 8th to close to 3-2, but O's Manager Buck Showalter earned his paycheck. He brought in LHP Brian Matusz to intentionally walk LH hitting Robinson Cano to set up a matchup with switch-hitting Nick Swisher, who was 1-for-19 in his career against Matusz. Swish popped a weak flyball to left and the O's were out of danger. The Jets last-gasp efforts were done in by the Texans D, and there was no magic for the Yankees in 9th (as opposed to the night before) against Baltimore's 51-save closer Jim Johnson. So I spent a night engrossed in every detail of my two favorite squads, and they both lost. But there are takeaways, otherwise the time would've been wasted - which would haunt me more. For the Jets, they look troubled but aren't that bad off at 2-3. The 3 losses are to Pittsburgh, San Francisco and Houston. No shame in any of that, even if the last two were home. For the Yankees, they're right where they're supposed to be. They won the AL East, and now just have to win 2-out-of-3 at home to advance to the ALCS. The next potential conflict is Sunday. The Jets host the Colts at 1 PM, and the Yankees will presumably (hopefully?) have the Tigers in the Bronx for ALCS Game 2.